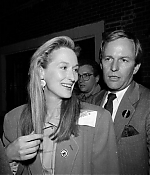 Since it’s June 22, no post would be possible without sending some birthday wishes to Meryl Streep, who turns 62 today! Regarding today’s update, a batch of rare pictures from various public appearances throughout the 1980s have been added to the image library. Previews and list below. Enjoy the new additions!